Just was wondering if there are any members that own the 2019 Kingquad and was wondering what their thoughts were. 500 or 750. 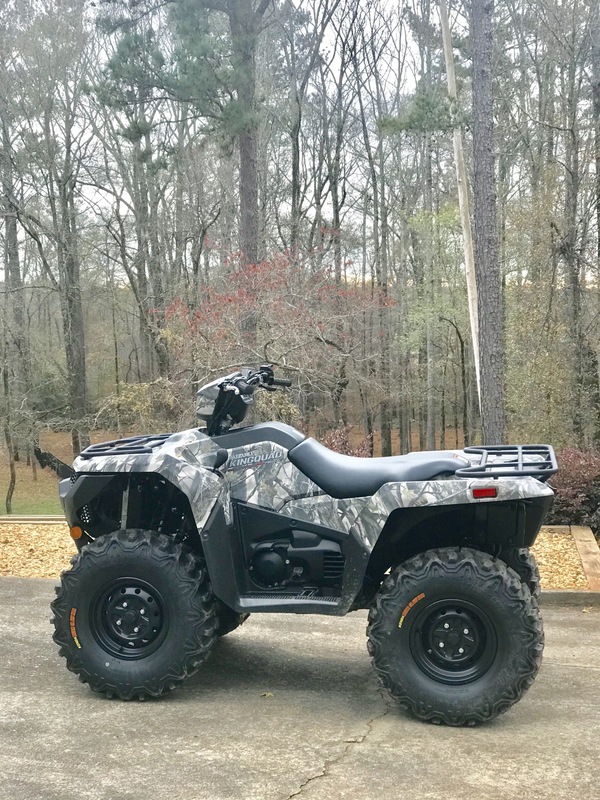 I bought a 2019 kingquad 750 se a few weeks ago. Its the first Suzuki quad Ive owned and the biggest engine size. So far I really like it. 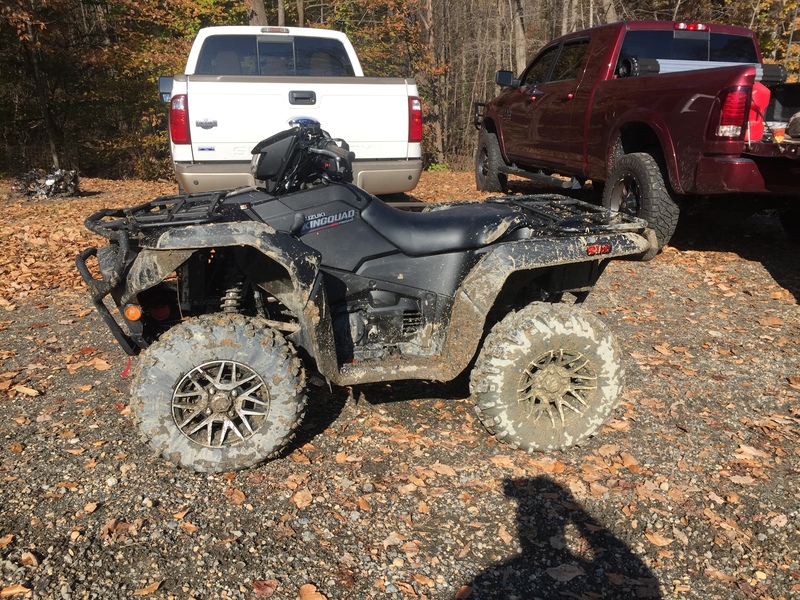 Ive owned several quads mostly in the 450 to 500 cc size. Im 55 years old and not into the mudding thing. I mostly ride my Suzuki locally in the woods a bit and cruise around my neighborhood. Man is the 750 powerfull. It has a somewhat gentle takeoff, but the midrange is awesome. It will accelerate from 25 to 55 mph a a few seconds. The extra power is fun, but truthfully i would probably have been fine with 500. I traded a 2018 Yamaha viking for the Suzuki. The side by side just wasnt fun to me. Ive never ridden any of the big v-twin quads to compare the Suzuki 750 to, but to me its a blast to ride. It all boils down to what your riding style is and how much power you want. The 500 and the 750 are basically the same bike with different engines. Either one should be a great machine. They have a quality look feel and ride. Which ever you choose, get the power steering. Its worth the extra dough. jwglaze and Kmmdad50 like this. I was first introduced to Suzuki in 2013 when I bought a 2005 Suzuki Eiger 400 Automatic intentionally for my wife to learn to ride on. That didn't work out because even though she will not admit it she's a little scared of it. She had a bad experience years ago on her cousins mini-bike when he said yeah sure you can ride it,but he failed to tell her it had no brakes, and she got hurt. I was leary at first because I'd never owned a Suzuki before and grew up riding Honda's, but I had done some research and decided to go for it. So far the little Suzuki Eiger has been a good machine. I like Ben don't do the deep mudding or deep water stuff, I trail ride and don't get wild because at 58 years old myself I don't heal as fast as I did in my teens and twenty's. Recently about 5 months ago I came across a good deal to me on a Arctic Cat 650 H1 TRV 4x4, for those that don't know TRV means (Two Rider Vehicle) or some like to say 2up. My wife loves riding the ATV but as a passenger for now with me, maybe someday she'll go solo. Also for those that don't know Arctic Cat is somewhat a cousin to Suzuki, Suzuki engines was supplied for Arctic Cats a few years back and the design of my Arctic Cat H1 engine was based off a Suzuki engine design. One of the problems I see with the Suzuki KingQuad is they do not offer a TRV or 2up ATV. I would probably jump all over that Suzuki 750 if it was offered in a TRV model myself. I like the looks of the new 2019 model and I believe they have made a few upgrades from the videos I watched on it. Personally I don't think you could go wrong coming from a person that grew up riding Honda motorcycles and ATV's I believe they are tough machines. Very interesting. Very good review. That looks like the factory suzuki 2019 front bumper, any pics from the front? My 19 eps camo with 27” Bearclaw HTR’s, overall it's a more refined machine than my 09, smoother, quieter, better suspension, stiffer frame, stronger mounts but now with bushings, it just does everything a little better and feels really dialed in, no popping on decel either. Since the 19's now have 25 gram rollers all you need is the dalton secondary spring and your good, very happy so far. Last edited by Drew van Hoof; 12-06-2018 at 06:13 PM. Update, I installed the dalton orange spring and cant really tell much difference, this tells me the factory spring was changed to match the lighter rollers, I'm starting to think they used the dalton dsk750c kit as the basis for the 2019 clutch changes. Which is a good thing, just not for me since I already installed the dalton maybe unnecessarily. Also I bumped my preload one notch up from stock on the front shocks and two notches up on the rear, same way I dialed in my 09 and it feels firmer and balanced front to back now, cornering is definitely flatter than the pre 2019 bike.